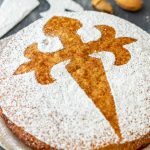 Spanish Almond Cake is a rich flourless dessert that is popular all over Spain. To make this sweet treat you only need 5 simple ingredients. It’s also naturally gluten-free! In a mixing bowl, beat the eggs with a fork. Mix in the sugar. In a separate bowl combine together ground almonds, lemon zest and cinnamon. Add this to the mixing bowl and using a wooden spatula stir until well combined. Pour the batter into a 7-inch/18cm springform pan lined with baking parchment and bake for 35 minutes or until an inserted skewer comes out clean. Let it cool completely before dusting with powdered sugar. Use 3 small to medium eggs. If you are using large eggs, use only 2. This recipe can be doubled. If you double the recipe, use a larger springform pan. Powdered sugar = Icing sugar. For more detailed explanation and tips, I recommend reading the whole post.